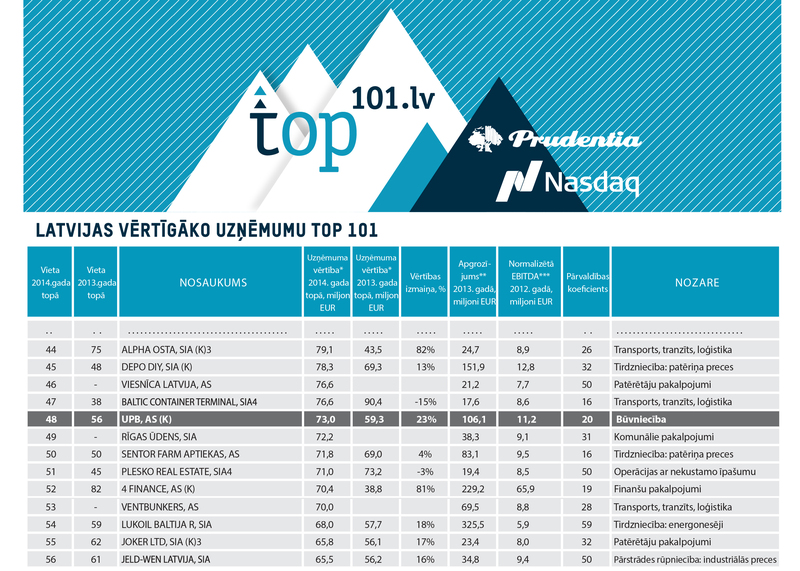 In TOP 101 of the most valuable companies for 2014, compiled by Prudentia and Nasdaq Riga, UPB has been acknowledged as the most valuable construction company in Latvia. In the joint listing of Latvian companies for 2014, UPB takes the high 48th place, improving its position by 8 places compared to 2013, when UPB was the 56th. The research shows that value of total assets of UPB has increased from EUR 59.3 million in 2013 to EUR 73 million in 2014, showing an increase of 23%. TOP 101 of the most valuable Latvian companies for 2014 includes 7 construction companies. Since 2006, that was the first year of TOP 101, UPB has been named as one of the most valuable companies in Latvia eight times. Publicly available annual reports of the companies were analysed when creating the listing. This year annual reports of 400 companies were analysed, 101 most valuable were selected. Companies were compared by such indices as value and changes in value of a company, net sales, EBITDA and corporate governance coefficient.